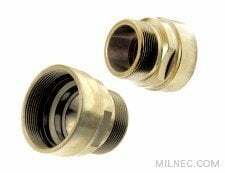 The MIL-DTL-22992 QWLD backshell adapter enables the use of a strain relief backshell with MIL-DTL-22992 connectors by providing compatible threads. Strain relief backshells should only be used in clean, dry applications. For complete protection, upgrade to a MIL-DTL-22992 compatible environmental backshell.